The approach trek for Pisang peak climbing is the popular Annapurna circuit trek till Chame.From Chame we follow the trail to the Pisang village from where the path ascends through alpine woods and yak pastures. We set up the base camp at Kharka at (4,380m). High Camp is set up at (5,400m approx ) on the South-West Ridge. The peak is made up of steeply tilted rocks , the deep slope of which faces the valley below. There will be snow at the high camp from the end of November to the end of March. Day 01: Arrival in Kathmandu , transfer to hotel. Day 18: Trek to Tatopani (1183m), enjoy hot spring. All same as above , except the fooding and accommodation will be in the mountain lodges instead of camps. 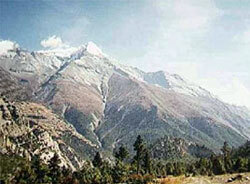 However we would arrange camps for the base camp and for climbing period.